January 9 – January 16. 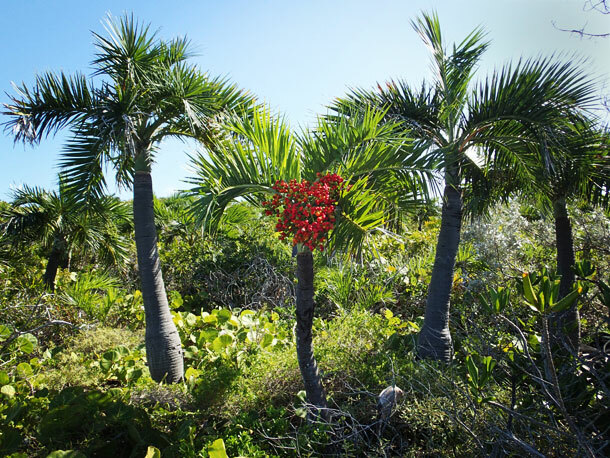 The Jumentos chain of islands defines the southeastern edge of the Great Bahama Bank. Itâ€™s a 60 mile string of tiny islets that offer very little protection from the tides that surge from the Atlantic onto the bank and then course back. There is only one town, Duncan Town. 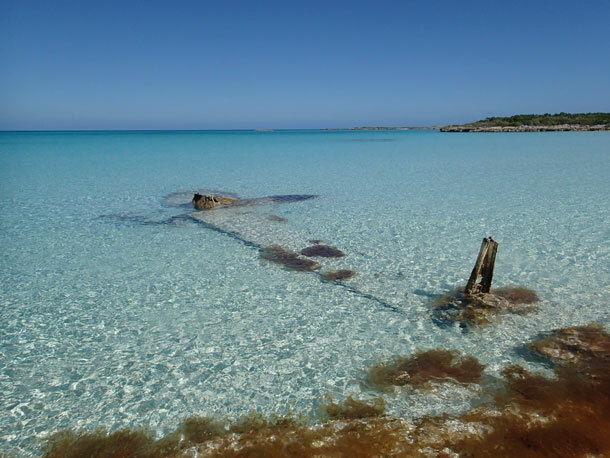 Itâ€™s on Ragged Island, the largest cay at the bottom of the chain. Thirty years ago Raggedâ€™s population was over 100. Now half as many souls live there. The rest of the cays are uninhabited, with one exception. This is not the place for the casual cruiser. These are remote fishing waters. 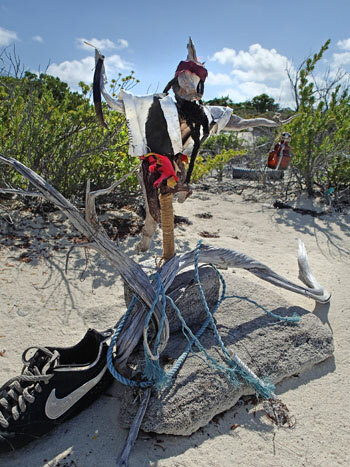 Hereâ€™s what the Explorer chartbook has to say: the cays â€œare a place for self reliance. There are no marinas, no BASRA, no fuel, little water, and a few supplies. You are on your own here.â€ It takes us two days to get from Long Island to the first tenable anchorage. We know you will probably never come here, so weâ€™d like to bring the Jumentos to you. 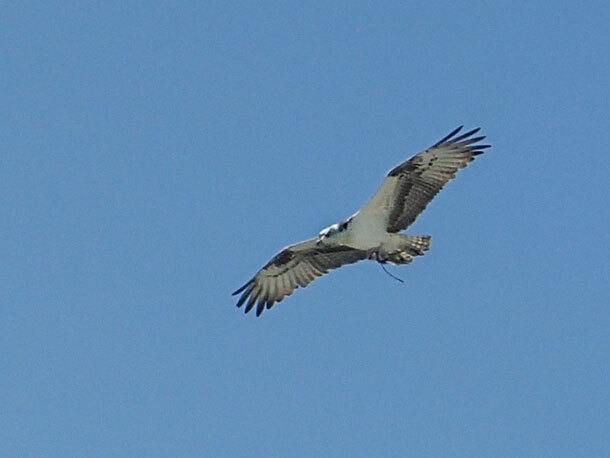 Osprey hovers over its nest. At high tide Water Cay becomes two cays. Notice the osprey nest on the top of the cliff to the right. Click this picture to enlarge. Hit the back button in your browser to return to the blog. 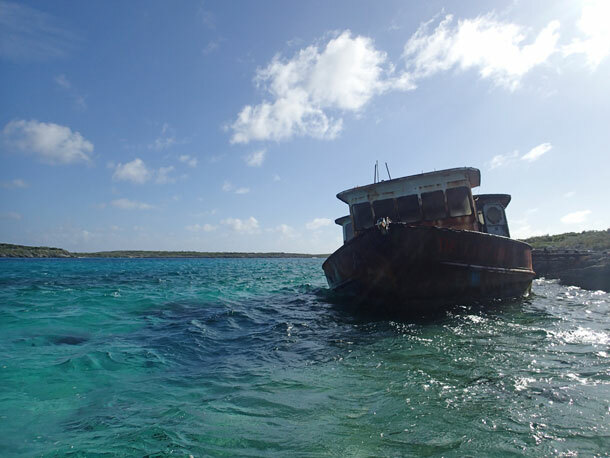 Wreck off of Water Cay. View looking south from a cliff at Water Cay. 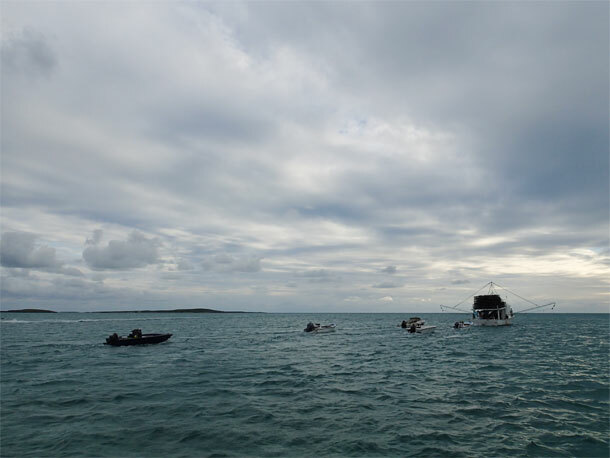 We sail from our â€˜unpleasantâ€™ stay below Little Exuma Cay. There are still storm clouds and some rain. We head directly south about 20 miles to Water Cay. The cay itself is beautiful. Itâ€™s a 2.5 mile barrier against the Atlantic Ocean. We check out the length of the isle and park near the center. 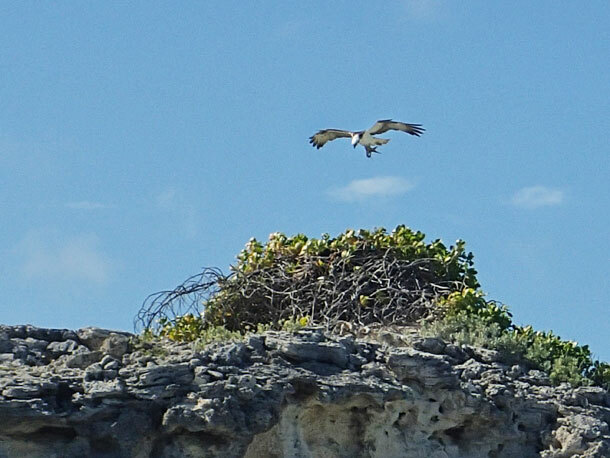 There is a nest of ospreys on a nearby cliff. The wary birds watch our every move as we explore the northern end of the isle. We put a bridle onto the anchor line. We do this just about everywhere in the Jumentos. The tidal current whips around these isles sending waves in from the sides. The intent of the bridle is to keep us pointed into the worst of the waves so Blue Wing doesnâ€™t lurch from side to side. Things change, and I usually jump up every few hours during the night to make adjustments. 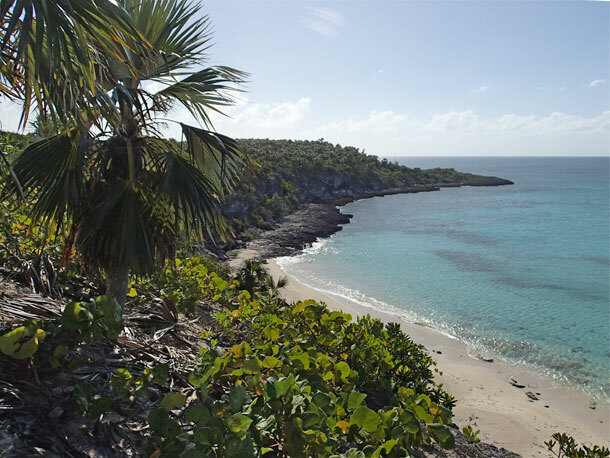 The next day we move to explore the south end of the cay. A Spanish mackeral has adopted us. Duwan says heâ€™s friendly and Iâ€™m not allowed to try and spear him. 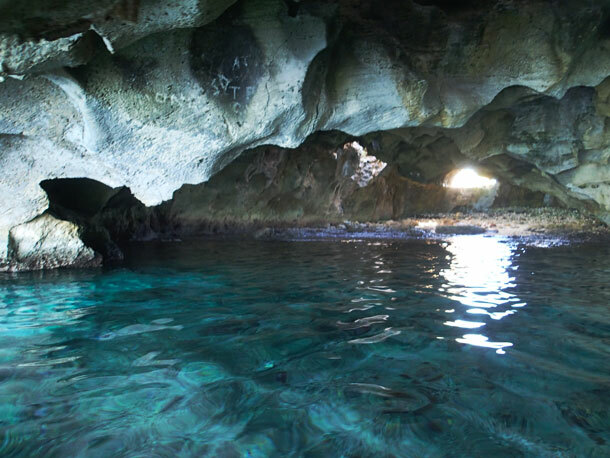 Dink-in cave at Flamingo Cay. 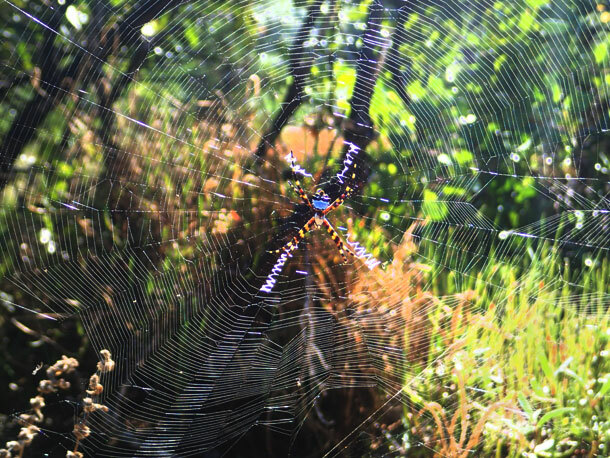 Lots of spider webs on the trails of Flamingo Cay. Remains of a sea plane crash on beach at Flamingo Cay. 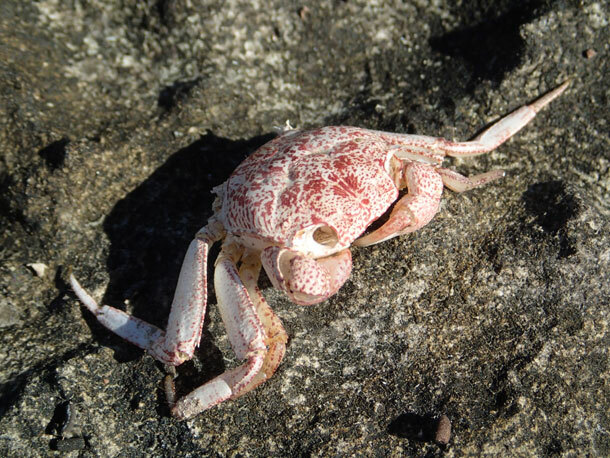 Crab on a trail at Flamingo Cay. We finally used our underwater camera underwater! 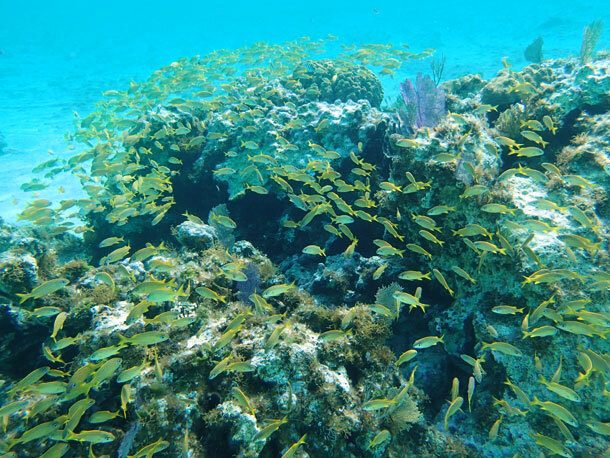 Baby yellow snappers at Flamingo Cay. Our next stop is Flamingo Cay. Itâ€™s just ten miles away, but the wind is brisk. Even though it is from the same direction as the tide, we get an impressive sense of how big the waves can be here in the gaps between islands. We re-evaluate our plan to sail across the wide opening between here and Buena Vista Cay. We want to make sure the tide and wind arenâ€™t at odds with each other. We see our first other boats at Flamingo Cay. They are fisherman. They main boats look like shrimpers with trawling arms extended from each side. Instead of nets the arms have anchors. The anchors are suspended below water level to stabilize the boats. 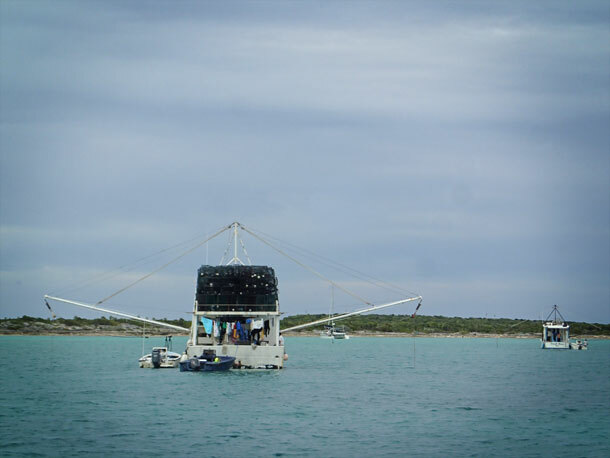 Each trawler has several 16-18 foot open air tenders. Each tender has a two man crew in wet suits. These guys motor out and spearfish in all types of weather, bringing their take back to the trawlers. From Flamingo we sail to Jamaica Cay. I wish I could say something about our stay here. Oh, the anchor held. 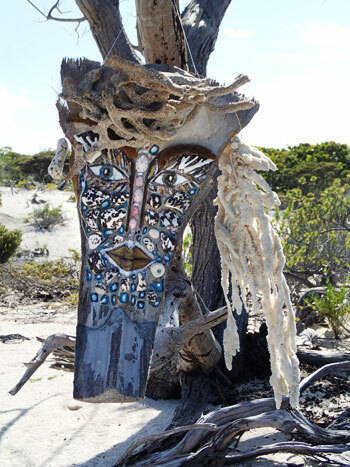 Artwork on the beach of Buena Vista. Artwork on the beach at Buena Vista. More artwork on the beach. 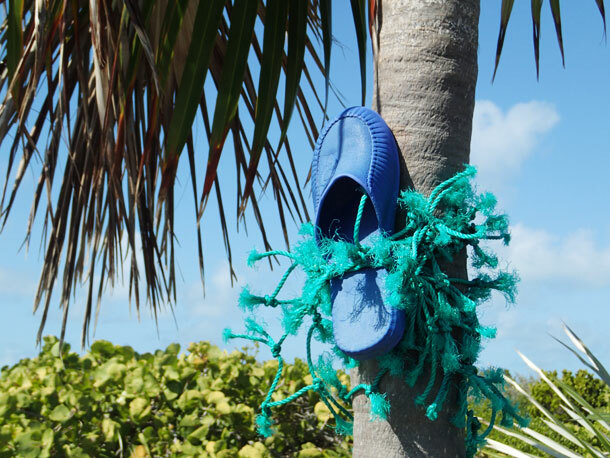 You see lots of jetsam on all of the beaches of the Bahamas, but I think all of the shoes that fall overboard end up in the Jumentos. They make great trail markers. Our next stop was beautiful Buena Vista Cay. We were hailed on our approach by John from â€˜Sam the Skullâ€™. He and Barbara dink out for a chat. He tells us their catamaran is named for a Scottish kidâ€™s song about a cat. Iâ€™d love to hear it. John has a good radio. He tries to keep in touch with all the cruisers in the Jumentos. He tells us there are only seven boats here. A big blow is coming tomorrow night and weâ€™d be better off on the other side of the island. In Low Water Harbor. He encourages us to visit Edward, who lives on the cay by himself. Late the next afternoon we move to Low Water. We are exposed to the strong southwest wind, but when the wind shifts north we will have protection. We get the wind shift about 4am. With the waves still coming from the west we get gale force winds from the north. In addition to all the other noise we hear something rattling around on deck. Oh no. Did I forget to secure the anchor pin? When the sun comes up I go above for a look. The pin is in place, but some small pieces of coral and seaweed are on deck. It takes a lot of wind and wave to toss coral on your deck! Fishing trawler tows it’s tenders. 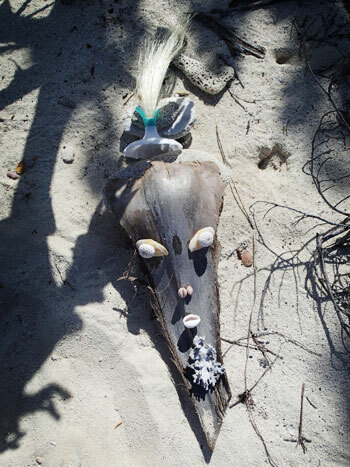 This entry was posted in Life on the Water, The Bahamas, The Jumentos and tagged Jumentos. Bookmark the permalink. Saw Karen last night. She’s revved up and roaring to go.